Successfully saved Greek Chicken Gyro Pita Pizzas to your Calendar. You can also save the ingredients to your Grocery List. 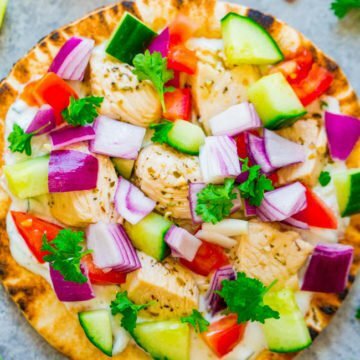 Greek Chicken Pita Pizzas: Chicken gyros transformed into FAST, EASY, and HEALTHY pita pizzas!! There's juicy chicken, homemade tzatziki sauce, tomatoes, cucumbers, onions, and feta on pita bread!! FRESH and LIGHT! !